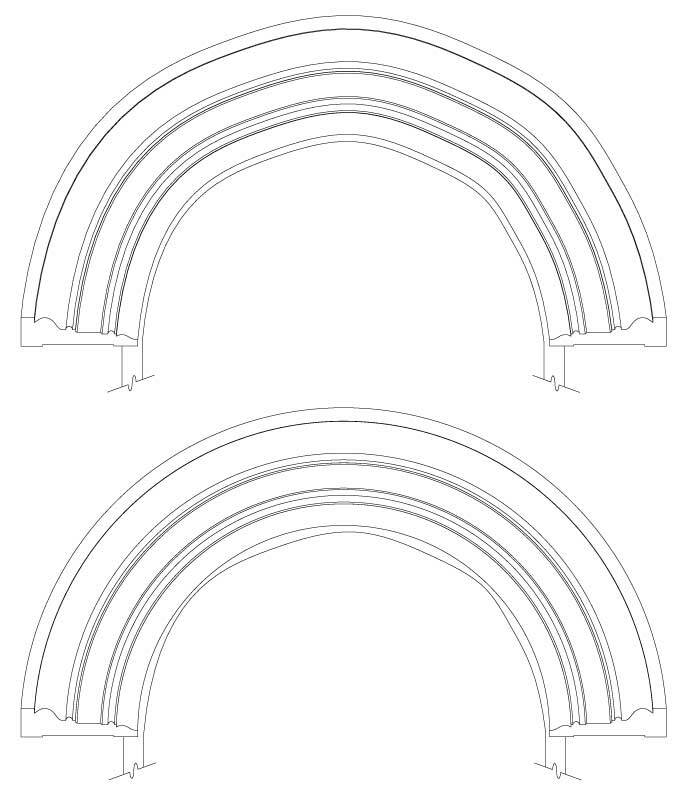 When ordering arched wood mouldings for a project, clients often provide templates made directly from the window, door, or cased opening jamb. It seems logical that the arched trim should match the curve of the jamb in order to acheive the best fit. While that may be logical, the results may not be what the client expects. The drawings at right, illustrate the manufacturing options for creating arched casings. The choice is between matching the jamb shape exactly or creating a true radius arch. Though the effects are exaggerated to make a point, they accurately describe the outcomes. The top drawing shows the consequences of matching the jamb shape exactly. In an effort to make the reveal conform exactly to the shape of the jamb, the imperfections of the jamb are repeated and amplified across the entire profile. The bottom drawing shows how a true radius is the better choice. The imperfect jamb is less noticeable because only the reveal shows the inconsistencies. The eye instead focuses on the many consistent radial shadow lines and tends to ignore the imperfect jamb shape and reveal.